The No. 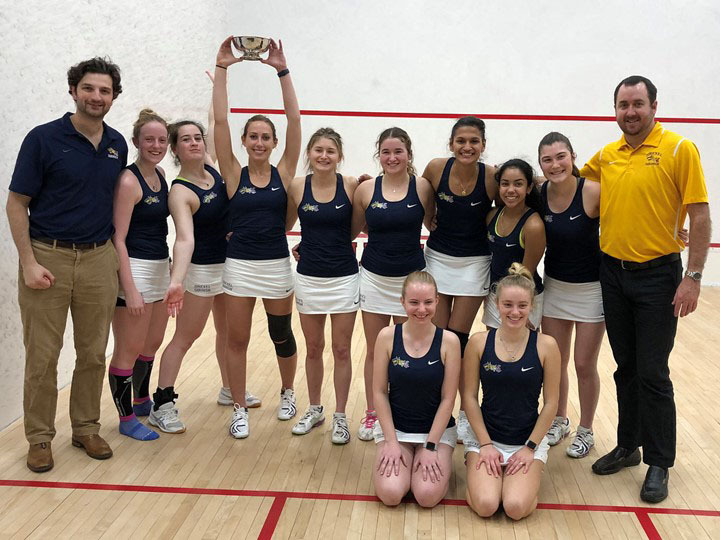 9 Drexel University women’s squash team triumphed Feb. 18 over No. 10 Dartmouth College, 6-3, to win the Kurtz Cup B Division title. This is the first time the Dragons have held the title in program history. An impressive 9-0 sweep of No. 16 Amherst College Feb. 16 began the team’s road to success. Not a single game was dropped as they took down the Mammoths and progressed to the Kurtz Cup semi-finals the following day. The following day, Feb. 17, the Dragons took a crucial win over No. 13 Brown University, 7-2. The top of the line-up held consistent once again to help the Blue and Gold progress on the day. Exciting achievements came from senior Ryan Morgan, who became the first Drexel women’s squash player to win 50 career matches. Freshman Hannah Blatt also took her 15th match of the season to tie the program’s single-season mark. This success led to Blatt being named the Drexel School of Education Athlete of the Week Feb. 19. The Hughes sisters made light work of the No. 1 and 2 positions, sophomore Anna Hughes taking down Quincy Beck in three games and senior Hayley Hughes finishing off her opponent in four. This was followed by Morgan and Blatt’s wins in the next two spots, both in three games. Freshman Ona Prokes toughed out a 15-13, 11-4, 12-10 match against Katrina Northrop and junior Fiona Power worked hard to take a 11-6, 16-14, 11-9 win over Catherine Kimmel. While the Dragons dropped their games at No. 7 and 8, freshman Emma MacGillivray, in the final ladder position, came up huge to win over Lauren Kotin, 11-3, 11-3, 11-3. The crowning achievement came Feb. 18 as the team lifted their first Kurtz Cup in Cambridge, Massachusetts. The Dragons finally got the best of Dartmouth, despite having fallen against them in the final of the same competition for the last two years. Finishing their competitive season with a six-match win streak, the Dragons end with an overall 11-8 record. The top six positions took wins on the day to ensure the Dragons got the victory. Despite the losses in the final three positions, all players fought to take their matches to four or five games. Starting at No. 1 Anna Hughes managed to bring it back from two games down to outlast Anne Blasberg, 6-11, 9-11, 11-5, 11-3, 11-8. Hayley Hughes then dominated over opponent Rebecca Brownell at No. 2 with an 11-8, 11-9, 11-9 sweep. Morgan didn’t hesitate to take yet another win over Sandra Reiss at No. 3, 11-7, 11-5, 11-5. The win for Hayley Hughes was the 46th of her career, tying her with Mary Fung-a-Fat for second most in program history, while Morgan continued to push her winning record to a new high of 51 career victories. At No. 4, Blatt took an easy 11-6, 11-2, 11-4 sweep over Brynn Bank. This came as her 16th of the season, the most ever by a Drexel women’s squash player in a single season. Prokes won in four over Janel Gaube at No. 5, 12-10, 11-5, 8-11, 11-7, to finish off a seven match winning streak. In the final win at No. 7, Power overpowered Julia Potter in a four-game victory, 11-4, 11-5, 8-11, 11-6.